Welcome to the first edition of Unincorporated Area Community News, a monthly newsletter designed to provide valuable information about the services King County provides to unincorporated areas and how residents can be engaged in King County's programs and planning. You can find the newsletter online with links to program details, at www.kingcounty.gov/UnincorporatedAreaNews. Please let us know if this information is helpful and if there are other topics you'd like to see covered in the newsletter. Send your ideas, comments and suggestions to lauren.smith@kingcounty.gov. This month Executive Sims will sign the 2009 budget that was adopted by the King County Council on Nov. 24. The Council's budget incorporates nearly all of the Executive's recommendations, and it restores funding for the Sheriff's storefront offices in unincorporated areas and money to continue the King County Fair. King County is using unpaid employee furlough days as part of its overall effort to reduce expenses in light of the current budget crisis. The mandatory furloughs will mean most county offices will be closed 10 additional days in 2009: Jan. 2, Feb. 13, April 10, May 22, June 19, July 6, Sept. 4, Oct. 12, Nov. 25 and Dec. 24. It's time to get a flu shot  before the influenza season hits its peak. Vaccine is now widely available. For more information about seasonal influenza, where to get a flu vaccine, and costs, please visit www.kingcounty.gov/health/flu, or call Public Health's information line at 206-296-4949. More than 100 county residents joined Executive Sims at the Joint Annual Forum of the Unincorporated Area Councils, hosted by the Upper Bear Creek Community Council, Oct. 28 at the Avondale Bible Church Hall near Woodinville. Learn more about the county's unincorporated area councils. The King County Agricultural Commission wants to hear from the public as it studies the future of farming in King County. Residents can view details of the study, provide input online or attend one of four upcoming public meetings: Jan. 8 in Woodinville, Jan. 22 in Carnation, Feb. 12 in Auburn and March 12 in Enumclaw. Meetings begin at 7 p.m. 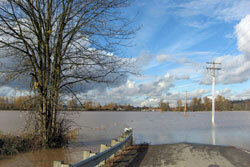 The King County Emergency Coordination Center is collecting information about flood damage. To report flood damage, please fill out the online form or call 206-296-3830. Get up-to-the-minute flood information by calling the Flood Warning Center at 206-296-4535 or 800-768-7932. If your electricity goes off, be sure to avoid using charcoal grills or electric generators inside, because of the carbon monoxide poisoning risk they create. Also, some refrigerated foods and medicines should not be consumed if the electricity goes out. View disaster preparedness fact sheets and flyers. With a shaky economy, high hay prices and winter weather here, King County Animal Care and Control staffers are anticipating rough times ahead for some local animals. That's why King County Animal Care and Control has created a resource page on their Web site to help livestock owners find support and resources. King County residents will have more access to staff and services at the Department of Development and Environmental Services (DDES) under a new department work schedule and co-location with the Community Environmental Health section of Public Health – Seattle and King County. Effective the week of December 15, DDES will expand office hours by one hour each day, Monday through Thursday. The new operating hours on these days will be 7 a.m. until 5 p.m., and the department will be closed on Fridays. The department is located at 900 Oakesdale Ave. SW in Renton. Public Health's Community Environmental Health section, which provides septic, drinking water, plumbing and gas piping services, has moved from Eastgate to the DDES offices in Renton and will also operate on the four-day schedule. Please call 206-296-4932 if you have any questions. King County Metro Transit is operating different bus schedules during the winter holidays. Bus riders should check schedules in advance of these holidays to make sure both their route and trip are in operation. Give experiences instead of stuff and save! King County's Waste Free Holidays program features discounted gift offers on "experience gifts" from more than 150 businesses. Through Dec. 31, participating businesses and organizations offer discounts on music, plays, sporting events, museums, restaurant meals, massages, fitness and much more. Personalize your gifts and cards this holiday season while making a difference for King County Parks through an online marketplace for custom-printed items. Zazzle offers a wide range of postage, holiday cards and t-shirts featuring scenes of King County parks and open space areas, and 27 percent of the net sales go to King County Parks to help cover maintenance and operation expenses. This holiday season King County Animal Care and Control will have an adoption booth at Kent Station mall during certain times to promote their "Season of HOPE" event to Help Orphaned Pets Everywhere. Keep your holidays safe by using food safety rules. The Enumclaw Forested Foothills Recreation Association held two community workshops in November to gather public input for a development of a regional comprehensive management vision for the region. The document will be distributed to local government agencies and others to express the community's collective vision to inform management, development and conservation decision. Project funding is through a grant from the National Forest Service, with support from King County. In November, King County signed a Community Partnership Agreement with three community groups in the Four Creeks area: the Four Creeks Unincorporated Area Council, the Community Alliance to Reach Out and Engage and Stewardship of Wetland Areas by Neighbors. The partnership will result in community stewardship of Cemetery Pond, a shared vision for Coalfield Park, and curbing illegal dumping in the area. Removing invasive reed canary grass, which was accomplished with the help of private property owners, is the first step in a long-range plan to address chronic drainage problems and flooding in May Creek. Response has been positive since King County Metro Transit increased bus service to greater Maple Valley and other southeast communities. Metro recently extended two morning trips on Route 143 to serve Maple Valley and Black Diamond, and debuted a new Route 157 with weekday peak-commute service between Lake Meridian Park-and-Ride and downtown Seattle. Metro has boosted service on southeast routes 153, 164 and 915. The Ravensdale Park master plan is completed, and Phase One design development is under way. This includes a synthetic soccer field conversion, upgrading baseball diamond infield, installing a community meadow and new buffer plantings. Phase One construction begins in mid 2009. King County Parks and Recreation Division removed a long line of Lombardy Poplar trees along the southern edge of Steve Cox Memorial Park in White Center, because the trees were in declining health. A local tree service company took the trees down, and Parks crews re-planted the area with native spruce, fir and cedars. The project was completed in late November. King County's 2009 adopted Road Capital Improvement Program includes $284,000 for a pilot project to reconstruct a 330-foot segment of Avondale Road that is currently in need of repair due to broken and misaligned concrete panels. The county is considering several options for reconstructing this segment which will help determine the best approach for rehabilitating the remaining 2.5 mile length of the oldest part of the corridor in the future. King County Parks has recently established a District Maintenance Shop at Cottage Lake Park. The change allows for increased maintenance of the park and other sites within the new district. A direct route path improvement is planned for easy access to the park's concert venue, and landscape improvements will enhance the concert experience. The Friends of Island Center Forest received a $100,000 Community Partnership Grant (CPG) through the Vashon Forest Stewards, to design, permit and construct trailheads, equestrian parking, trails, and interpretive elements for Island Center Forest, while the Friends of Dockton Park will receive a $42,500 CPG through the Vashon Maury Island Heritage Association, to design and construct an interpretive historic trail loop and interpretive signs throughout Dockton, an interpretive shelter and new community sign. King County's request to end operation of an out-of-compliance concrete recycling facility on the former Anderson property in West Hill was denied recently by the King County Superior Court. The timeline provided by the court should see the property reclaimed by the end of 2009. The next meeting with the UAC is scheduled for Jan. 14, from 4-5 p.m. at DDES in Renton. 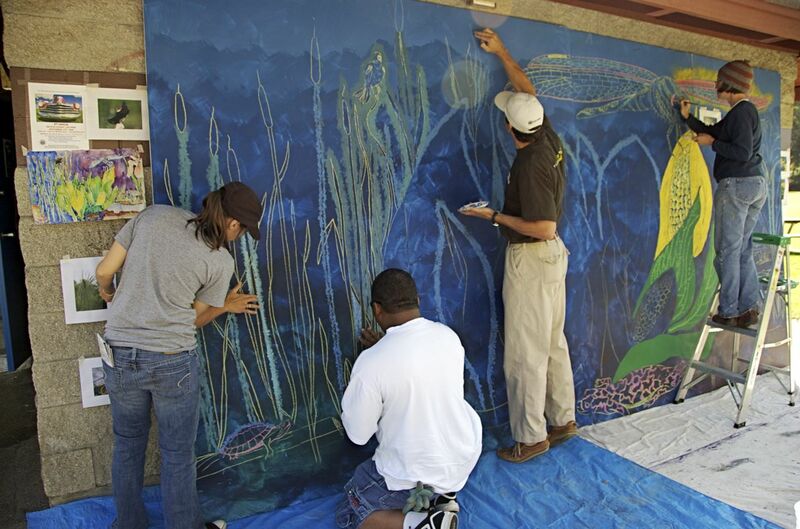 After nearly a year's worth of public outreach and meetings, the West Hill community celebrated the community-generated vision for Skyway Park in September, with a party in the park that included a mural painting and a habitat restoration workday.